Influenza or commonly “flu” is a type of viral infection that is presented with symptoms like fatigue, fever and respiratory congestion. It is highly contagious and affects primarily the respiratory system. 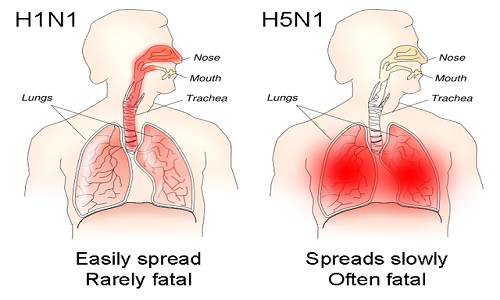 Flu is typically caused by influenza A viruses belonging to strains H3N2, H2N2, H5N1, H7N7, H1N2, H9N2, H7N2, H7N3, H10N7, H7N9 and HIN1, two types of influenza B viruses and rarely by one strain of influenza C virus. Influenza often mimics the symptoms of common cold and in severe cases may lead to pneumonia and septicaemia. Antibiotics are ineffective in treating influenza as because it is a viral disease, however influenza may be managed by vaccines and antiviral agents. The influenza viruses may inhibit the formation of Adrenocorticotropin hormone which results in decreased levels of cortisol. Since the immune system is not depressed, there is a formation of pro-inflammatory cytokines and chemokines that helps to combat the viral infection and is also responsible for the fever, headaches associated with influenza. Symptoms fatigue, fever, running nose(rhinitis) and respiratory congestion Abdominal cramps, nausea, vomiting, stomach ache, Loss of appetite, diarrhoea and dehydration. Sagarika Mukarjee. "Difference Between Flu And Stomach Flu." DifferenceBetween.net. October 5, 2017 < http://www.differencebetween.net/science/health/difference-between-flu-and-stomach-flu/ >. Duben-Engelkirk, Paul G. Engelkirk, Janet (2011). Burton's microbiology for the health sciences (9th ed. ed.). Philadelphia: Wolters Kluwer Health/Lippincott Williams & Wilkins. p. 314. Longo, Dan L. (2012). "187: Influenza". Harrison's principles of internal medicine. (18th ed. ed.). New York: McGraw-Hill.